When I got excited about ham radio again I decided to start setting some goals for myself. Time to review my goals for 2016. 1. Earn 100 SOTA Activator Points – ACHIEVED! My 2016 total for Activator Points was 211. I had a terrific time activating with my sons Nick N6NGG and Will N6WMG. Avid mountain hikers, we were not shy about going for some of the tough summits locally including Iron Mountain W6/CT-056 and San Gorgonio W6/CT-245. I also met some of the folks who are involved locally with SOTA here in Southern California. Finding like minded peak bagger/radio enthusiasts is great and I even ended up doing some joint activations with Paul W6PNG. I look forward to doing more in 2017. One of the highlights of 2016 was activating Mt. 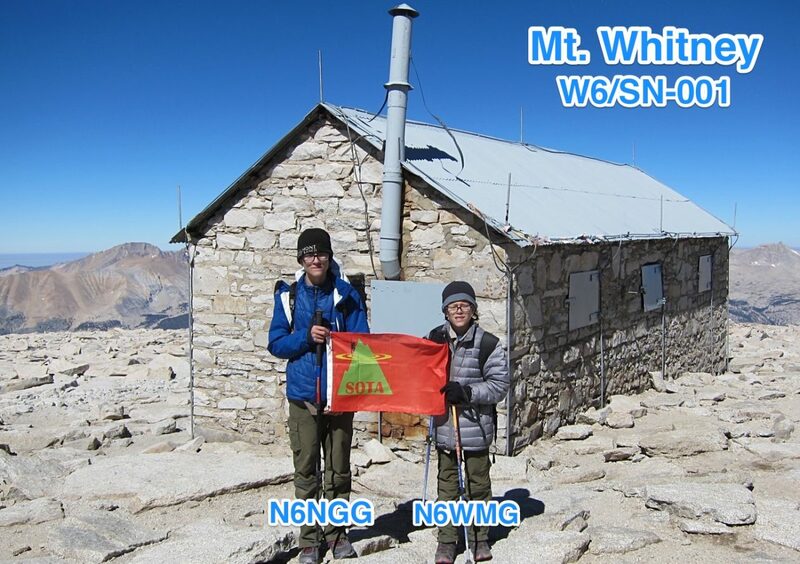 Whitney W6/SN-001 with my sons. 2. Copy and Send CW at 20 WPM – ACHIEVED! In the last year I have completed both the CW Academy Levels I and II and I am currently in the Level III class. I have become comfortable with SOTA exchanges and contest speeds upwards of 30+ wpm. Where I am still deficient is when someone gets off the “script.” I still struggle with conversational head-copy above about 18 wpm. I assume that time, practice and persistence will improve this. The best part is that CW proficiency has allowed me to drop my “boat anchor” KX3 and switch to a MountainTopper 5B at 6 ounces! I was able to get one of the dads in out scout troop interested in ham radio but he has yet to take his test. However, closer to home, my sons getting their licenses renewed my father’s interest in ham radio and after 48 years away from the hobby he got licensed again and was able to get his old callsign back! I count this as missed because I was not able to get a “new” person into the hobby. 4. Build a Project Kit – ACHIEVED! I certainly learned a lot about electronics over the last year. I acquired all kinds of new gear and even a fancy soldering station. I completed one QRPGuys kit and built a number of small projects. Nothing terribly complex yet but at least I started. 5. Succeed with QRP – ACHIEVED 50/50! I have succeeded with QRP as far as SOTA is concerned, especially now that I am activating with a MTR-5B running a max of 5 watts. On the home front, while I started using my KX3 I eventually succumbed to the desire for more bells and whistles (and power) and upgraded to a Icom 7300. Overall I am pleased with my progress in 2016 and am looking forward to more adventures with ham radio in 2017.